Ravenwood is a collaboration between Chris Lanier and Dana McClure on a 4-acre cow pasture which they bought in 2010 with hopes of turning the place into a small vegetable farm. Seeking creative ways to integrate their work, life and community between Brooklyn and Upstate New York, they started hosting intimate dinners showcasing produce and small-batch products made on the farm. As Ravenwood has grown over the years, Chris and Dana have worked on a number of projects and gatherings, including our Autumn gathering, last year. Now they are renovating a 19th Century barn on their property to serve as the Ravenwood outpost. 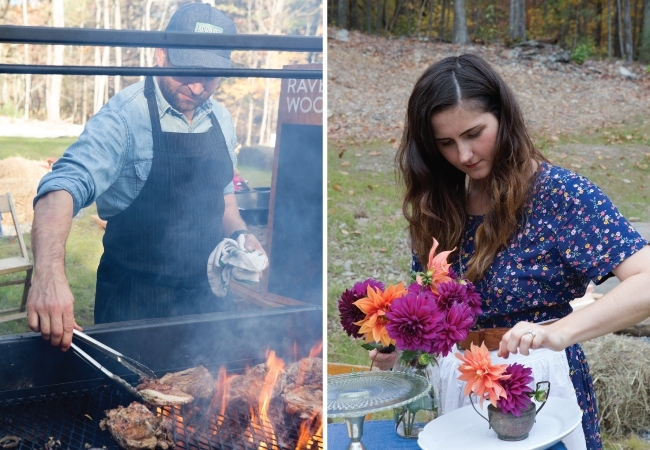 Without further ado, here are two Spring recipes from Ravewood that you can make at home. 4) Cut asparagus into 2 inch pieces. 6) Put asparagus in oven safe saute pan and put in hot oven. Cook for 10 minutes or until charred and tender. Stir half way through cooking. 10) Add radish to bowl with asparagus. 13) When egg timer is up, remove egg from water with slotted spoon. 15) Very gently peel the egg. The inside will be soft, so be careful.